It’s hard for me to believe that I’ve made it so long without sharing some Caravaggio in this space. My favorite painter for almost ten years, this Italian artist and major influence for the Baroque style, is famous for his use of dramatic lighting, and this particular painting was one of the first of his which I saw in person as my obsession dawned. As with all his pieces, the sense of movement and light make it seem alive. The chaos is palpable; at the same moment that Judas kisses Jesus, the soldiers seize him, and the disciples flee. This split-second moment is stopped for our painful contemplation. They say that in our dreams, parts of us are all the characters. In this painting, which parts of you are Judas? Which parts of your are the soldiers, seizing Jesus to arrest him? 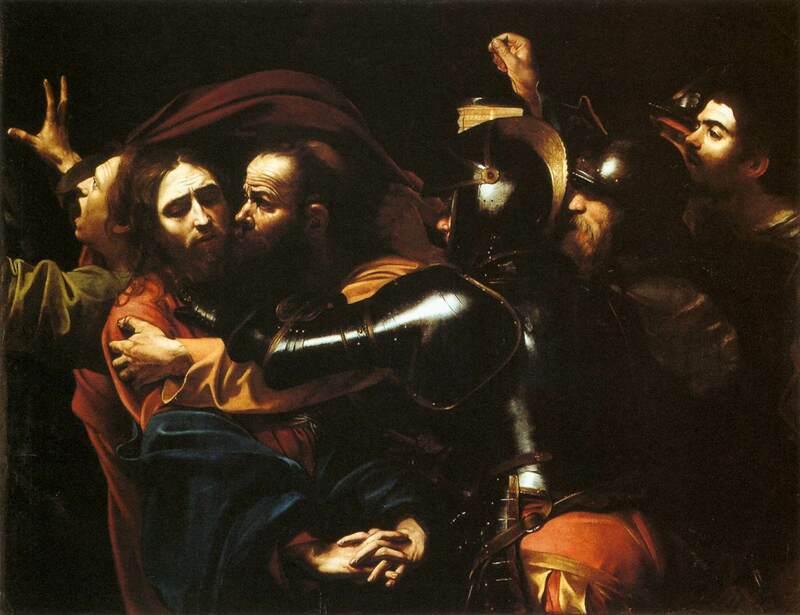 This entry was posted in art, Friday Icon, Good Friday and tagged art, Caravaggio, Friday Icon, Judas by Emily. Bookmark the permalink.